SAORI is a hand-weaving program to discover your true individuality. We have 4 slogans to understand and enjoy SAORI weaving. *Consider the difference between Human made and Machine made. *Have clear eyes to keep fresh. Enjoy weaving as you like! What we may call mistakes are flawless. They create designs of which have their own uniqueness. You can discover your true self if you push yourself beyond your limitations. You will have more self confidence, while you weave in a meditative manner. ... Would you like to weave like that? There is also a way to become a SAORI instructor (SAORI Leader's Committee). Contact SAORI head office (Osaka, Japan), SAORI branches or Certified SAORI Weaving Studios. 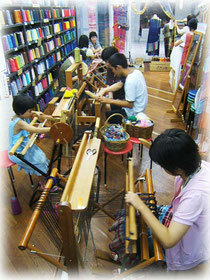 Learn basic skill from warping to weaving, Basic technique of weaving, Saori cloth pattern making etc. *you can continue a basic class anytime when you finish 12 times. *The class will open 10:00-12:00, 13:00-15:00 between Tue and Sat. *The material fee is not included. The reseavation is needed when you enroll. Learn basic skill from warping to weaving. Make a scarf or tapestry per a day. Another classes are also available, contact us if you are interested.